19 June. Perry officially becomes a grumpy old man.Waaah! No really, I couldn't eat another thing. Oh, is that squid over there? 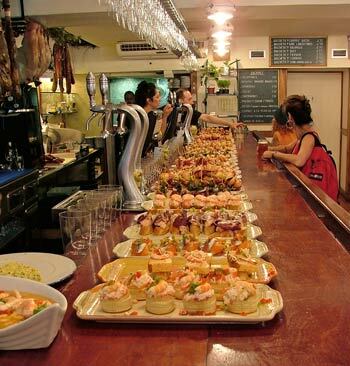 The Pintxos, or tapas, of San Sebastian were a feast for the eyes and mouth. which Caroline's dad, Peter, had reupholstered. Perry managed to catch more logs than fish. 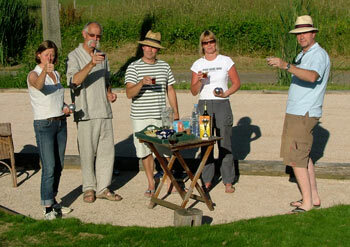 The boules court finally opened after a week or two of wet, log-fire weeks at the beginning of June. We invited Jacques and Ina and our part time neighbours Max and Julie, who happened to be over for a week. Caroline decked out the court with bunting and enough drinks and snacks to keep us all happy. A few bottles of rosé and the games began. Like all courts, there are a few slight dips and slopes, which make it more interesting. Perry loves the court and has been improving his game whenever possible. We'd rather have this than a swimming pool any day. We don't have to wait until the water is warm enough, everyone can play, no matter what their age or physical ability and it's social and an ideal way to end the day. 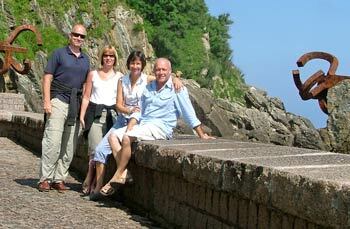 We decided to go to San Sebastian for Perry's birthday. We'd never been there and had heard so much good stuff about the place that it had been on our 'things to do' list for some time. Since Max and Julie were here, we invited them to join us. It is easy to get to from here, about 2,5 hours. Finding the hotel, we got the car into the underground parking and didn't use it again until we left. San Sebastian is a very pretty city, with a beach bay and an old town, full of narrow streets and tapas bars. Needless to say, we headed straight there and indulged in some mouth-watering pintxos (as the northern Spanish call tapas). They were fantastic, with fish, anchovies, urchins, eels, crab, squid, jamon and prawns. Washed down with a cold beer or red wine, the trip was worth it just for that. I'm dribbling just writing this. That evening, we dined in a pretty little restaurant and had some great Rioja and Navarra wines, Basque chicken and lamb. Caroline had quietly spoken to the waitress and when my profiterolles arrived it was accompanied by 'Happy Birthday' in Spanish over the sound system and there was one with a candle in it. Then another candle-lit pudding went past and we realised that there was someone else celebrating their birthday. Suddenly a twenty-something blonde girl came round the corner, spotted Perry and his candle and gave him a big hug and a kiss. Made his day. Passing Ernest's house, Perry saw Alain and Damien fishing in the pond. They were trying to catch small tench and minnows to use as live bait for catching pike. They invited us to join them that evening at the lake in Puydarrieux, so we made up a picnic and wrapped up against the wet. 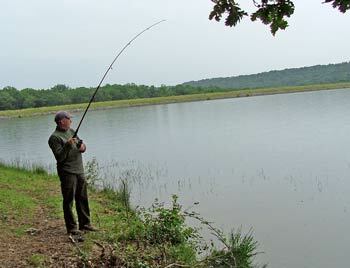 Setting out four rods, we had two with live bait for the pike and two to fish for more small fish. After three hours, we had a couple of extra small fish and not a bite from the pike. But we did manage to have a fine dinner on blankets under the trees as the rain came down, washed down with pastis and wine. 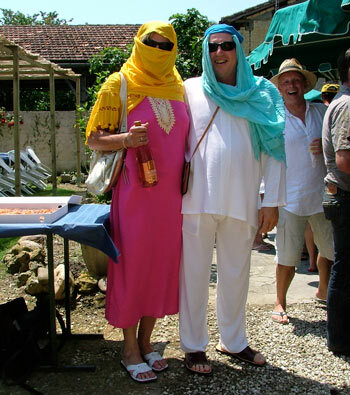 Mid June we were invited to a CousCous party at Serge and Brigitte Bruzaud's house in Trie. 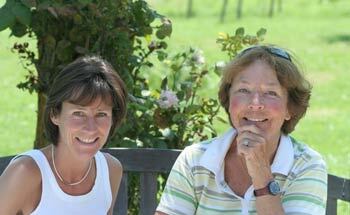 They run several shoe shops and run the events committee for Trie. We got to know them through the rugby and other social events over the early Summer. It started with apéros for an hour or so, a fantastic couscous and then the fun began. 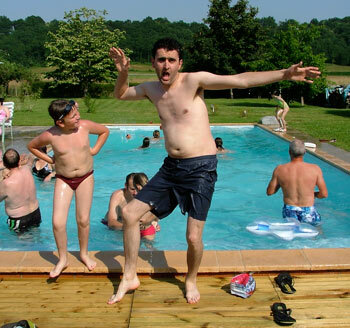 One by one, people ended up in the pool. Mostly fully clothed. Caroline being the first to be grabbed and thrown, though she managed to take her attacker with her. This went on all afternoon but was soon replaced by more sedate activities such as boules and quilles, a form of French skittles. Around 9pm we all returned to the table and helped ourselves to cold meats, cheeses and more couscous. The next day was a very quiet affair. Caroline's parents, Peter and Marianne arrived for a couple of weeks and were immediately in action, cleaning the house, working in the garden and helping us prepare for Perry's 50th birthday party. The original idea was to have a Sunday lunch with some friends and neighbours. Some music, food and boules. Perry was going to England the week after to a family reunion at his parents' place in Cornwall and his brothers and sisters were all coming. So no need to go mad twice. What was going to be a gathering of about thirty turned into a party with over 100 people. The whole process snowballed and thanks to Caroline's meticulous planning being adjusted at each moment, it was a great success. Everyone was asked to bring a platter of their choice that could feed four. Either as a starter, main course or dessert. Everybody responded with the most delicious array of dishes and everything was eaten. We started with apératifs under the parasols we had lent from all and sundry. Ernest's sister Jeanette and her friend Lucette made some stunning amuse bouches with the drinks and Mandy and Jonathan, who have a B&B in Bonnefont, manned the bar like solid professionals. The banda arrived and Yannick had the place rocking for four hours. Called to the tables, we had placed under the chestnut tree, there was enough shadow for all. We had borrowed all the tables and benches from the Mairie to seat everyone and Caroline and her mum had spent all morning setting and decorating the tables. Perry's mate Malcolm and his two sons worked the barbecues all lunchtime and Perry's sister Penny, who had driven over from her home in Majorca, didn't stop running around filling glasses, washing up (with Marianne, Claire and Odile - thanks girls!) and generally getting stuck in. 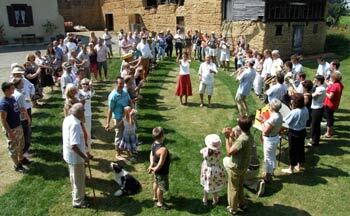 We'd set up a horseshoe of tables in the small, open barn where all the dishes were laid out. 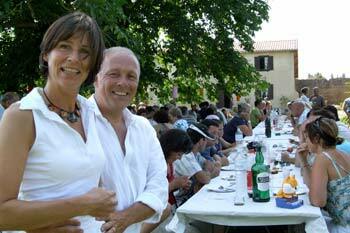 With a flourish from Yannick and a welcome from Perry and the queues for food began. 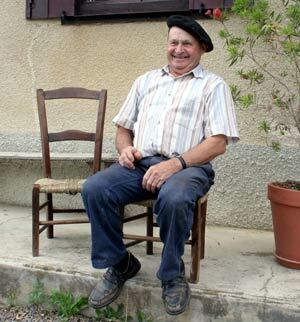 Later Perry gave a speech in French and the Mayor of Puydarrieux got up and made one too, followed by him and our neighbour Christian singing some songs from the mountains, in harmony and acapella. It made the hairs on the back of our necks raise up. It was a magic moment among many that day. 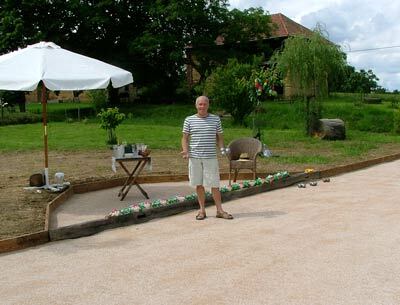 On to the boules court where Angus organised the competition with a steel hand. 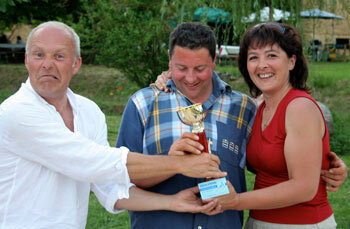 Perry made it to the final with Malcolm's son Charlie, but the seasoned team of Christian and Véronique took the trophy. An unforgetable day. Thanks to all who came and made it so special. For a full photo reportage, check out our new online gallery. We found an old roller in the barn. 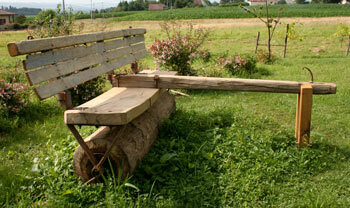 Made of solid oak, it weighed a ton. After a long debate as to what to do with it, we consulted our Dutch friend Jacques, who works with steel. 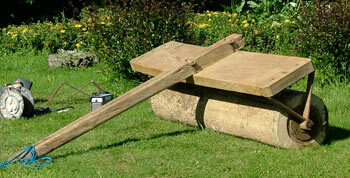 He came up with a triangle shaped foot design that would stabilise the roller and allow us to use it as a bench in the garden. A week or so later he arrived with his welding gear and we dragged the roller, with the car, to its position in the garden. An hour later, the feet were welded on and he had bolted three shoes to the back so that we could attach a side panel from an old cart. 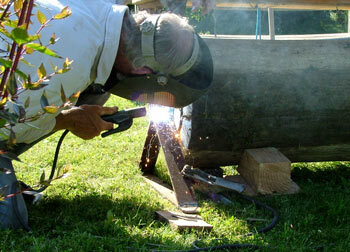 Ernest came by and added the finishing touch by setting an oak foot under the tow arm. Another perfect spot for some evening sun.